We have noted before that writers love to overuse capital letters. There seems to be something so magical about putting random nouns, verbs, and yes, even adjectives in upper case that normally prudent writers throw all caution to the wind. Staid and sober essays become All Capitals, All The Time. So what’s the harm? I hear you ask. Precisely this: when the restraint of formal written English is thrown away for a carnival atmosphere in which anything goes, the persuasive value of the content plummets. You’ll recall that readers—even those who aren’t grammar mavens—have an excellent ability to detect when grammar rules are being broken, and bad grammar drives away clients and customers. The lesson, then, is to show restraint when using capital letters. Specifically, today’s lesson is about using upper case when referencing compass directions—an error I have been noticing more and more often online, especially when content writers present driving directions to their business locations. The four primary points on a compass—east, north, south, and west—are known as the cardinal directions. Between them, we will find the ordinal or intercardinal directions, such as southwest, west-northwest, and an infinite number of other descriptors. Capitalize a direction or a phrase containing a direction if any other word in the same place would be capitalized in ordinary usage because it’s a proper noun; the first word in a sentence; a key word in a title or headline; the name of a book, periodical, or other work of art; the name of an organization; an abstract concept; or something similar worthy of capitalization. Capitalize a direction or phrase if it’s a widely recognized place name that would be identified as such on a map. Otherwise, leave the direction or phrase in lower case. 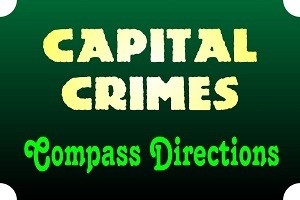 Note, in particular, that compass points used in isolation shouldn’t be capitalized. Each of the compass directions has an associated adjective, too: think southern as the counterpart to south. Surprisingly enough—because we’re used to English having frequent exceptions to the general rules of grammar—directional adjectives follow the same guidelines we use for compass directions. That means we will most often use lower case unless special circumstances apply. Of course, making sure you’re using capital letters in the right places is just one small aspect of producing first-rate content for your professional website. At Foster Web Marketing, we know full well how difficult it can be to keep all the balls in the air while making your performance look effortless. For those moments when you need a little bit of inspiration, our book—The Foster Web Marketing Clients’ Guide to Great Content—is a capital resource, and you can get it today as a FREE download. Get it, read it, and see how it can open your eyes to a new approach to website writing. Who Gets to Decide What Counts as “Good Grammar”?